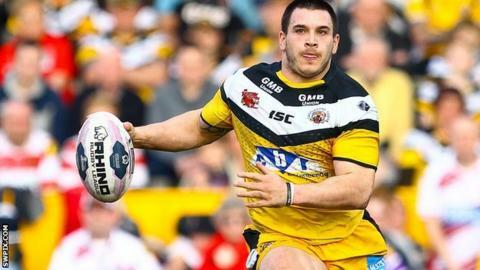 Australian winger Justin Carney scored four tries as top flight side Castleford Tigers proved too strong for Championship outfit Sheffield Eagles. Cas scored nine first tries inside the opening 40 minutes and could have been further ahead had Kirk Dixon converted more than the two kicks he put over. The Tigers scored four more tries after the break, with Carney adding a personal fourth. Scott Taylor, Duane Straugheir and Tom Ashton scored the three Eagles tries. Tigers boss Daryl Powell and his Eagles counterpart Mark Aston were once team-mates and remain good friends but there was no room for sentiment as the Super League side ran out comfortable winners. Sheffield began the game well and were rewarded when Turner worked his way over out wide, but the lead was soon wiped out when Carney dotted down early on and the former Canberra and Roosters three-quarter then gathered a Liam Finn chip to overturn the deficit. Jake Webster laid on a try for Grant Millington to go in under the posts, with Dixon landing the first of his two conversions and Ashley Gibson picked up a first Tigers try shortly after. Four more tries, from Dixon, Jamie Ellis, Daryl Clark and Carney gave Powell's side a 32-point lead at the hooter, but the opening score of the second went to the Eagles as Straugher gathered his own kick before touching down. Castleford struck two further scores from Holmes and Carney either side of Ashton's close range effort to secure comfortable passage into Monday's draw. "It's an interesting line-up for the next round. There's a real potential to get to the semi-finals without playing a Super League team which doesn't happen too often. "We fell away at the back of the end of the game but we got the job done which is the main thing. "We were good when we needed to be. There was a big chunk of the first half when we took game away from them. We were a little sloppy in the second half but it's job done and we're in the next round, that's the main thing. I want to take this club as far as I can in the Challenge Cup this year." "We had a dig and that was important to us. Having watched their last three or four games they're playing really well and they're right on top of their game. "They're the best side in Super League at the moment and the brand of rugby they play is exciting. When you're coaching against that it's really not easy. I thought they ripped us to bits at times - and I'd be lying if I didn't expect that - but we had a dig. "The second half they ran at 100 per cent, they made no mistakes, and I'm immensely proud of the dig the boys had. We've had four hours of preparation this week so to lose the second period 24-12 is a great dig from our lads. You can see the gulf in certain parts of the game, without a doubt - but the job Daryl and his staff are doing here is outstanding." Castleford Tigers: Tansey; Dixon, Gibson, Shenton, Carney; Ellis, Finn; Wheeldon, Milner, Huby, Holmes, Webster, Millington. Interchanges: Sneyd, Massey, Clark, Mariano. Sheffield Eagles: Laulu-Togagae; Turner, Hanson, Straugheir, Burke; Walker, Brambani; Lillycrop, Henderson, Green, Garside, Aspinall, Taulapapa. Interchanges: Davey, Blagborough, Tagaloa, Ashton.